Friday, March 22 through Saturday, March 30 (9am - 6pm) every day and Sunday, March 31, 9am - 3pm (last day)! To participate, purchase a passport for $7, plus tax, at any of the 15 participating shops. Everyone that purchases a passport will receive a free 1/2 yard of fabric of their choice. Hoppers must have their passport booklets stamped at all 15 participating shops during the Shop Hop to be eligible to win the Grand prize, the 2nd prize, and 3rd prizes. Participants with at least eight stamps on their passport are entered in drawings that begin with the 4th prize. The back cover of the passport booklet has to be turned in at one of the shops before 3pm on Sunday, March 31st to be eligible for the prize drawings. Enjoy the unique look and inventory of each store and discover new patterns, ideas, fabrics, books, and other gifts. Collect a free project pattern and enter a door prize drawing at each shop. Each shop offers a coupon in the passport. The total value of the coupons can far exceed the cost of the passport. 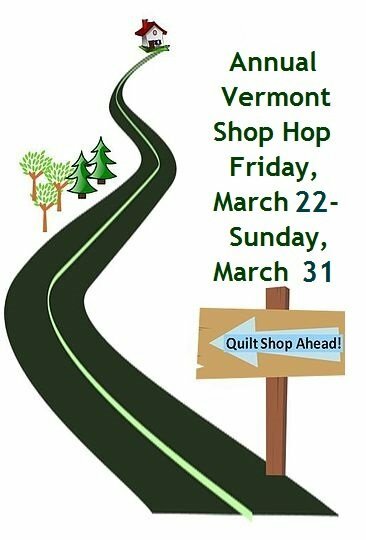 Visit www.vermontshophop.com for more information.